Librarians’ strong interest in programming is not surprising considering that programming skills are crucial and often essential to making today’s library systems and services more user-friendly and efficient for use. Not only for system-customization, computer-programming skills can also make it possible to create and provide a completely new type of service that didn’t exist before. However, programming skills are not part of most LIS curricula, and librarians often experience difficulty in picking up programming skills. In this post, I would like to share some effective strategies to obtain coding skills and cover common mistakes and obstacles that librarians make and encounter while trying to learn how to code in the library environment based upon the presentation that I gave at Charleston Conference last month, “Geek out: Adding Coding Skills to Your Professional Repertoire.” (slides: http://www.slideshare.net/bohyunkim/geek-out-adding-coding-skills-to-your-professional-repertoire). At the end of this post, you will also find a selection of learning and community resources. 1. Pick a language and concentrate on it. 2. Write and run the code. Once you choose a language to learn, there are many paths that you can follow. Taking classes at a local community college or through an online school may speed up the initial process of learning, but it could be time-consuming and costly. Following online tutorials and trying each example is a good alternative that many people take. You may also pick up a few books along the way to supplement the tutorials and use them for reference purposes. If you decide on self-study, make sure that you actually write and run the code in the examples as you follow along the books and the tutorials. Most of the examples will appear simple and straightforward. But there is a big difference between reading through a code example and being actually able to write the code on your own and to run it successfully. If you read through programming tutorials and books without actually doing the hands-on examples on your own, you won’t get much benefit out of your investment. Programming is a hands-on skill as much as an intellectual understanding. 3. Continue to think about how coding can be applied to your library. Also important is to continue to think about how your knowledge can be applied to your library systems and environment, which is often the source of the initial motivation for many librarians who decide to learn how to program. The best way to learn how to program is to program, and the more you program the better you will become at programming. So at every chance of building something with the new programming language that you are learning, no matter how small it is, build it and test out the code to see if it works the way you intended. 4. Get used to debugging. While many who struggle with learning how to code cite lack of time as a reason, the real cause is likely to be failing to keep up the initial interest and persist in what you decided to learn. Learning how to code can be exciting, but it can also be a huge time-sink and the biggest source of frustration from time to time. Since the computer code is written for a machine to read, not for a human being, one typo or a missing semicolon can make the program non-functional. Finding out and correcting this type of error can be time-consuming and demoralizing. But learning how to debug is half of programming. So don’t be discouraged. 5. Find a community for social learning and support. Having someone to talk to about coding problems while you are learning can be a great help. Sign up for listservs where coding librarians or library coders frequent, such as code4lib and web4lib to get feedback when you need. Research the cause of the problem that you encounter as much as possible on your own. When you still are unsure about how to go about tackling it, post your question to the sites such as Stack Overflow for suggestions and answers from more experienced programmers. It is also a good idea to organize a study group with like-minded people and get support for both coding-related and learning-related problems. You may also find local meet-ups available in your area using sites like MeetUp.com. Don’t be intimidated by those who seem to know much more than you in those groups (as you know much more about libraries than they do and you have things to contribute as well), but be aware of the cultural differences between the developer community and the librarian community. Unlike the librarian community that is highly accommodating for new librarians and sometimes not-well-thought-out questions, the developer community that you get to interact with may appear much less accommodating, less friendly, and less patient. However, remember that reading many lines of code, understanding what they are supposed to do, and helping someone to solve a problem occurring in those lines can be time-consuming and difficult even to a professional programmer. So it is polite to do a thorough research on the Web and with some reference resources first before asking for others’ help. Also, always post back a working solution when your problem is solved and make sure to say thank you to people who helped you. This way, you are contributing back to the community. 6. Start working on a real-life problem ‘now.’ Don’t wait! Librarians are often motivated to learn how to code in order to solve real-life problems they encounter at their workplace. Solving a real-life problem with programming is therefore the most effective way to learn and to keep up the interest in programming. One of the greatest mistake in learning programming is putting off writing one’s own code and waiting to work on a real-life problem for the reason that one doesn’t know yet enough to do so. While it is easy to think that once you learn a bit more, it would be easier to approach a problem, this is actually a counter-productive learning strategy as far as programming is concerned because often the only way to find out what to learn is by trying to solve a problem. 7. Build on what you learned. Another mistake to avoid in learning how to program is failing to build on what one has learned. Having solved one set of problem doesn’t mean that you will remember that programming solution you created next time when you have to solve a similar problem. Repeating what one has succeeded at and expanding on that knowledge will lead to a stronger foundation for more advanced programming knowledge. Also instead of trying to learn more than one programming language (e.g. Python, PHP, Ruby, etc.) and/or a web framework (e.g. Django, cakePHP, Ruby On Rails, etc.) at the same time, first try to become reasonably good at one. This will make it much easier to pick up another language later in the future. 8. Code regularly and be persistent. It is important to understand that learning how to program and becoming good at it will take time. Regular coding practice is the only way to get there. Solving a problem is a good way to learn, but doing so on a regular basis as often as possible is the best way to make what you learned stick and stay in your head. While is it easy to say practice coding regularly and try to apply it as much as possible to the library environment, actually doing so is quite difficult. There are not many well-established communities for fledgling coders in libraries that provide needed guidance and support. And while you may want to work with library systems at your workplace right away, your lack of experience may prove problematic in gaining a necessary permission to tinker with them. Also as a full-time librarian, programming is likely to be thrown to the bottom of your to-do list. 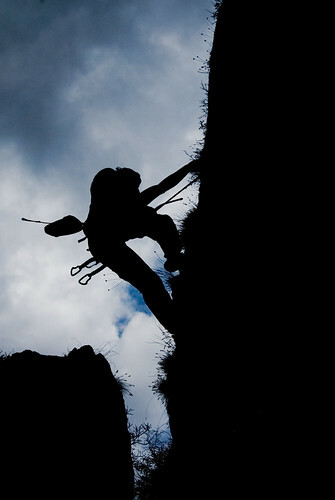 Be aware of these obstacles and try to find a way to overcome them as you go. Set small goals and use them as milestones. Be persistent and don’t be discouraged by poor documentation, syntax errors, and failures. With consistent practice and continuous learning, programming can surely be learned. Programming books in the Head First and the Visual QuickStart series. Local coding community meet-ups: PHP, Python, Ruby, etc. The first example is Pinboard. Many libraries moved their bookmarks in Del.icio.us to a different site when there was a rumor that Del.cio.us may be shut down by Yahoo. One of those sites were Pinboard. By getting your bookmark feeds from Pinboard and manipulating them, you can easily present a subset of your bookmark as part of your website. 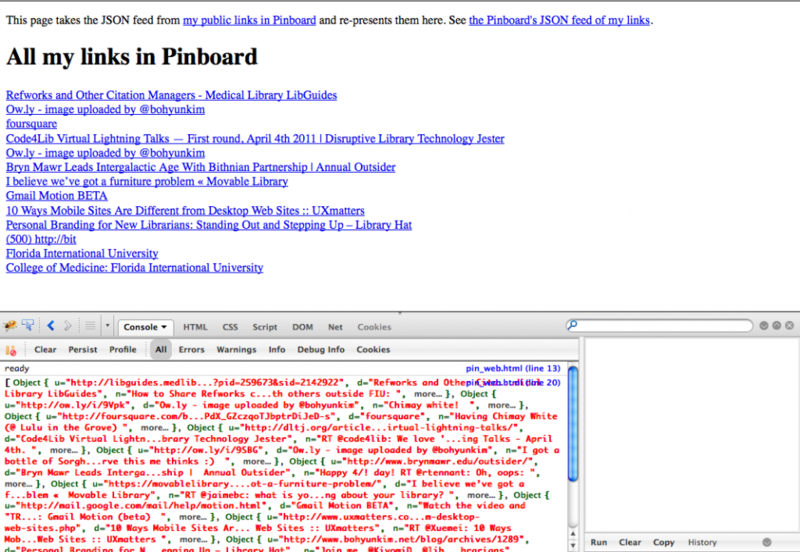 The following page uses JQuery to access the JSONP feed of my public bookmarks in Pinboard. 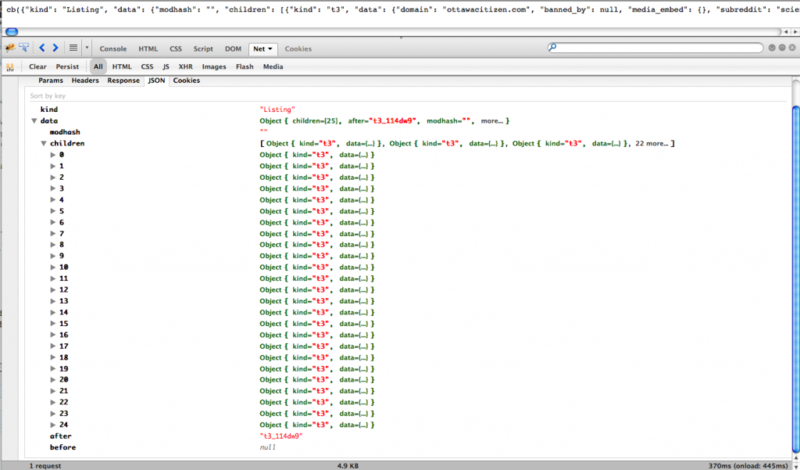 $.ajax() method is invoked on line 13. Line 15, jsonp:”cb”, gives the name to a callback function that will wrap the JSON feed data in it. Note line 18 where I print out data received into the console. 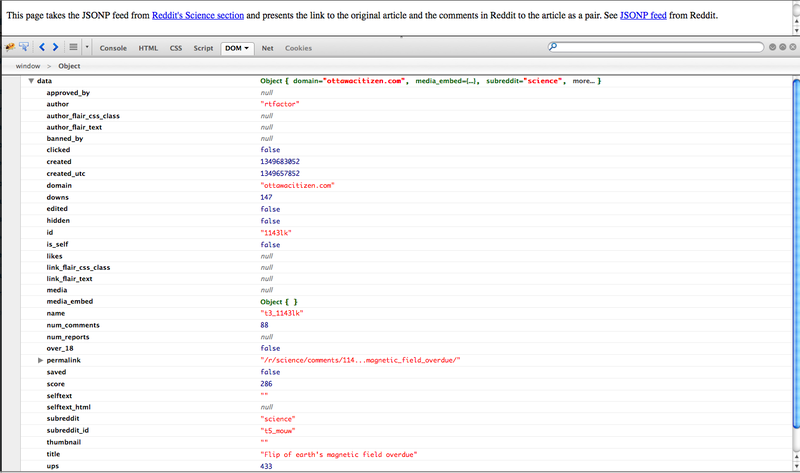 This way, you can check if you are receiving JSONP feed in the console of Firebug. Line 19-22 uses $.each() function to access each element in the JSONP feed and the .append() method to add each bookmark’s title and url to the “pinboard” div. JQuery documentation has detailed explanation and examples for its functions and methods. So make sure to check it out if you have any questions about a JQuery function or method. But it is much more convenient to see the organization and hierarchy of the JSONP feed in the Net panel of Firebug. And each element of the JSONP feed can be drilled down for further details by clicking the object in each row. Now, let’s display only five bookmarks. In order to do this, only one more line is needed. Line 9 checks the position of each element and breaks the loop when the 5th element is processed. Often libraries want to display bookmarks with a particular tag. Here I add a line using JQuery method $.inArray() to display only bookmarks tagged with ‘fiu.’ $.inArray() method takes value and array as parameters and returns 0 if the value is found in the array otherwise -1. Line 7 checks if the tag array of a bookmark (item.t) does include ‘fiu,’ and only in such case displays the bookmark. As a result, only the bookmarks with the tag ‘fiu’ are shown in the page. My second example uses Reddit API. Reddit is a site where people comment on news items of interest. Here I used $.getJSON() instead of $.ajax() in order to process the JSONP feed from the Science section of Reddit. In the case of Pinboard API, I could not find out a way to construct a link that includes a call back function in the url. Some of the parameters had to be specified such as jsonp:”cb”, dataType:’jsonp’. For this reason, I needed to use $.ajax() function. On the other hand, in Reddit, getting the JSONP feed url was straightforward: http://www.reddit.com/r/science/.json?jsonp=cb. Line 19 adds a title of the page. Line 20-22 extracts the title and link to the news article that is being commented and displays it. Under the news item, the link to the comments for that article in Reddit is added as a bullet item. You can see that, in Line 17 and 18, I have used the console to check if I get the right data and targeting the element I want and then commented out later. This is just an example, and for that reason, the result is a rather simplified version of the original Reddit page with less information. But as long as you are comfortable accessing and manipulating data at different levels of the JSONP feed sent from an API, you can slice and dice the data in a way that suits your purpose best. So in order to make a clever mash-up, not only the technical coding skills but also your creative ideas of what different sets of data and information to connect and present to offer something new that has not been available or apparent before. My second example uses Reddit API. Reddit is a site where people comment on news items of interest. Here I used $.getJSON() method instead of $.ajax() in order to process the JSONP feed from the Science section of Reddit. In the case of Pinboard API, I could not find out a way to construct a link for a call back function. Some of the parameters had to be specified such as jsonp:”cb”, dataType:’jsonp’. So I needed to use $.ajax() method. On the other hand, in Reddit, getting the JSONP feed url was straightforward: http://www.reddit.com/r/science/.json?jsonp=cb. Line 19 adds a title of the page. Line 20-22 extracts the title and link to the news article that is being commented and displays it. Under the news item, the link to the comments for that article in Reddit is added as a bullet item.You can see that in Line 17 and 18, I have used the console to check if I get the right data and targeting the element I want. This is just an example, and for that reason, the result is rather a simplified version of the original Reddit page with less information. But as long as you are comfortable accessing and manipulating data at different levels of the JSONP feed sent from an API, you can slice and dice the data in a way that suits your purpose best. The structure of a JSON feed can be confusing to make out particularly. So make sure to use the Firebug Net window to figure out the organization of the feed content and the property name for the value you want. But what if the site from which you would like to get data doesn’t offer JSONP feed? Fortunately you can convert any RSS or XML feed into JSONP feed. Let’s take a look! Consider this PubMed search. This is simple search that looks for items in PubMed that has to do with Florida International University College of Medicine where I work. You may want to access the data feed of this search result, manipulate, and display in your library website. So far, we have performed a similar task with the Pinboard and the Reddit API using JQuery. But unfortunately PubMed does not offer any JSON feed. We only get RSS feed instead from PubMed. Furthermore, there may be a pipe that has been already created for exactly what you want to do by someone else. As PubMed is a popular resource, I found a pipe for PubMed search. I tested, copied the pipe, and changed the search term. Here is the screenshot of my Yahoo Pipe. If you want to change the pipe, you can click “View Source” and make further changes. Here I just changed the search terms and saved the pipe. After that, you want to get the results of the Pipe as JSON. If you hover over the “Get as JSON” link in the first screenshot above, you will get a link: http://pipes.yahoo.com/pipes/pipe.run?_id=e176c4da7ae8574bfa5c452f9bb0da92&_render=json&limit=100&term=”Florida International University” and “College of Medicine” But this returns JSON, not JSONP. In order to get that JSON feed wrapped into a callback function, you need to add this bit, &_callback=myCallback, at the end of the url: http://pipes.yahoo.com/pipes/pipe.run?_id=e176c4da7ae8574bfa5c452f9bb0da92&_render=json&limit=10&term=%22Florida+International+University%22+and+%22College+of+Medicine%22&_callback=myCallback. Now the JSON feed appears wrapped in a callback function like this: myCallback( ). See the difference? Line 25 enables you to bring in this JSONP feed and invokes the callback function named “myCallback.” Line 14-23 defines this callback function to process the received feed. Line 18-20 takes the JSON data received at the level of data.value. item, and prints out each item’s title (item.title) with a link (item.link). Here I am giving a number for each item by (index+1). If you don’t put +1, the index will begin from 0 instead of 1. Line 21 stops the process when the processed item reaches 5 in number. 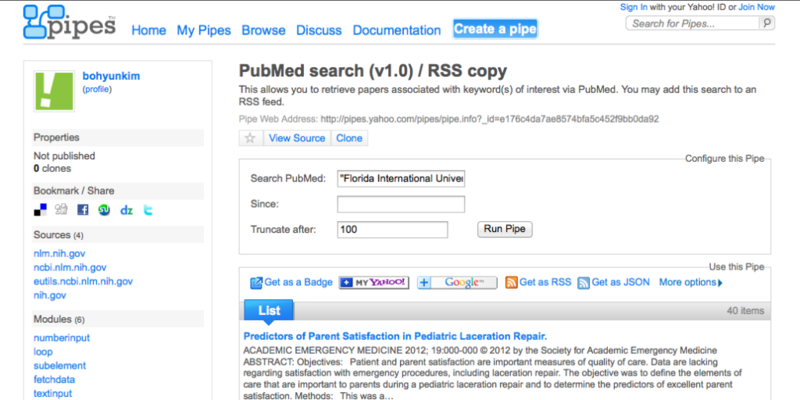 <p> This page takes the JSONP feed from <a href="http://pipes.yahoo.com/pipes/pipe.info?_id=e176c4da7ae8574bfa5c452f9bb0da92"> a Yahoo Pipe</a>, which creates JSONP feed out of a PubMed search results and re-presents them here. Do you feel more comfortable now with APIs? With a little bit of JQuery and JSON, I was able to make a good use of third-party APIs. Next time, I will try the Worldcat Search API, which is closer to the library world and see how that works. It has been 8 months since the Code Year project started. Back in January, I have provided some tips. Now I want to check in to see if how well you have been following along. Falling behind? You are not alone. Luckily there are still 3-4 months left. Teaching oneself how to code is not easy. One of the many challenges is keeping at it on a regular basis. Both at home and at work, there seems to be always a dozen things higher in priority than code lessons. Another problem is that often we start a learning project by reading a book with some chosen examples. The Code Year project is somewhat better since it provides interactive tutorials. But at the end of many tutorials, you may have experienced the nagging feeling of doubt about whether you can now go out to the real world and make something that works. Have you done any real-time project yet? If you are like me, the biggest obstacle in starting your own first small coding project is not so much the lack of knowledge as the fantasy that you still have yet more to learn before trying any such real-life-ish project. I call this ‘fantasy’ because there is never such a time when you are in full possession of knowledge before jumping into a project. In most cases, you discover what you need to learn only after you start a project and run into a problem that you need to solve. I found this example, “Flickr API – Display Photos (JSON)” quite useful. This example is at Jason Clark’s website. Jason has many cool code examples and working programs under the Code & Files page. You can see the source of the whole HTML page here . But let’s see the JS part below. Line 12 imports data formatted in JSON from Flickr, and the JSON data is wrapped in a JS function called jsonFlickrFeed. You can find these data source urls in API documentation usually. But many API documentations are often hard to decipher. In this case, this MashupGuide page by Raymond Yee was quite helpful. Line 3-8 are defining the jsonFlickrFeed function that processes the JSON data. You can think of JSON as a JS object or an associative array of them. Can you also figure out what is going on inside the jsonFlickrFeed function? Let’s go through it line by line. Line 5 creates another variable, markup, which will include a link and a title of “fr,” which is an arbitrary name that refers to the JSON data thrown inside the jsonFlickrFeed fucntion. Line 6-8 are a for-loop that goes through every object in the items array and extracts its title and link as well as the image source link and title. The loop also adds the resulting HTML string to the markup variable. Line 9 assigns the content of the markup variable as the value of the HTML content of the variable, container. Since the empty div with the “feed” id was assigned to the variable container, now the feed div has the content of var markup as its HTML content. Then they dynamically generate the content inside with the source data from Flickr following some minimal presentation specified in the JS itself. Below is the dynamically generated content for the feed div. The result like this. Strictly speaking, Flickr is returning data in JSONP rather than JSON here. You will see what JSONP means in a little bit. But for now, don’t worry about that distinction. What is cool is that you can grab the data from a third party like Flickr and then you can remix and represent them in your own page. Line 1-6 requests and takes in the data feed from the speicified URL in JSONP format. Once the data is received and ready, the script invokes the anonymous function from line 7-11. This function makes use of the JQuery method $.each(). For each of data.items, the anonymous function applies another anonymous function from line 9-10. Line 9 creates an image tag – $(“<img/>”), attaches each item’s media.m element as the source attribute to the image tag – .attr(“src”, item.media.m), and lastly appends the resulting string to the empty div with the id of “images” – .appendTo(“#images”). Line 10 makes sure that no more than 4 items in data.items is processed. You can see the entire HTML page codes in the JQuery website’s $.getJSON() page. So far we have looked through two examples. Not too bad, right? To keep the post at a reasonable length, I will get to the little bit of code that I wrote in the next post. This means that you can try the same and we can compare the result next time. Now here is the challenge. Both examples we saw used the Flickr API. Could you write code for a different API provider that does the same thing? Remember that you have to pick a data provider that offers feeds in JSONP if you want to avoid dealing with the same origin policy. Here are a few providers you might want to check out. They all offer their data feeds in JSONP. First, find out what data URLs you can use to get JSONP responses. Then write several lines of codes in JS and JQuery to process and display the data in the way you like in your own webpage. You may end up with some googling and research while you are at it. Verify the data feed URL to see if you are getting the right JSONP responses. Just type the source url into the browser window and see if you get something like this. Get the Firebug for debugging if you don’t already have it. Use the Firebug’s NET panel to see if you are receiving the data OK.
Use the Console panel for debugging. The part of data that you want to pick up may be in several levels deep. So it is useful to know if you are getting the right item first before trying to manipulate it. Happy Coding! See the following screenshots for the Firebug NET panel and Console panel. (Click the images to see the bigger and clearer version.) Don’t forget to share your completed project in the comments section as well as any questions, comments, advice, suggestions! Learn to Code in 2012! A great thing about this learn-how-to-program project, called #codeyear in Twitter (#libcodeyear and #catcode in the library-land) is that there are +375,443 people (and counting up) out there who are doing exactly the same lessons as you are. The greatest thing about this #libcodeyear / #catcode project is that librarians have organized themselves around this project for the collective learning experience. How librarian-like, don’t you think? Now, if you are ready to dive in, here are some useful resources. And after these Resources, I will tell you a little bit more about how to best ask help about your codes when they are not working for you. //Meet other librarians who are also doing the #codeyear project, ask questions, rant out your frustration, find support from your peers. //Meet other librarians – particularly catalogers – who are doing the #codeyear project. The wiki also includes useful resources (http://catcode.pbworks.com/w/page/49680175/Resources) for budding coders. //#catcode folks also set up an IRC channel for real-time chat. It is a nerdier version of group chat (e.g. Meebo, MSN, etc.) Read IRC info here at Code4Lib wiki (http://code4lib.org/irc/faq) but remember the channel name is #catcode instead of #code4lib. Syntax Error: Catch the most frustrating bugs! Let me tell you. Finding a typo is no triviality in coding. Catching a similar syntax error will save you from the most frustrating experience in coding. Can you figure out why these lines would not work? Give it a try! You won’t be sorry. Post your answers in the comments section. I am assuming that as #codeyear, #catcode, #libcodeyear project progresses, more people are going to ask questions about problems that stump them. Some lessons already have Q&A in the CodeAcademy site. So check those out. Reading through others’ questions will give valuable insight to how codes work and where they can easily trip you. That having been said, you may want to ask questions to the places mentioned in the Resources section above. If you do, it’s a good idea to follow some rules. This will make your question more likely to be looked at by others and way more likely to be answered correctly. Before asking a question, try to research yourself. Google the question, check out the Q&A section in the CodeAcademy website, check out other online tutorials about JS (see below for some of the recommended ones). Provide your codes with any parts/details that are related to the lines with a problem. (Bear in mind that you might think there is a problem in line 10 but the problem may lie in line 1, which you are not looking.) Highlight/color code the line you are having a problem. Make it easy for others to immediately see the problematic part. : This helps the possible commenter to know what your reasoning is behind your codes and what solutions you have already tried, thereby saving their time. So this will make it more likely that someone will actually help you. To believe it or not, what seems completely obvious and clear to you can be completely alien and unfathomable to others. ACRL TechConnect blog will continue to cover #libcodeyear / #catcode related topics throughout the year! The post up next will tell you all about some of the excuses people deploy to postpone learning how to code and what might break the mental blockage!